The Nebraska Appaloosa Hall of Fame was established in 2006 to recognize past members of the Nebraska Appaloosa Club for their support and dedication to the Appaloosa horse. In 2007, the Nebraska Appaloosa Horse Hall of Fame was established to recognize individual horses that have contributed in exceptional ways to the Appaloosa breed. Owned by Bob and Mildred Johannes. He was purchased from Elvin Blevins of Wynnwood, OK in 1968. He stood at the Johannes’s farm for a couple of months then went to the barn of Mose Salisbury in Sac City, IA. In 1968, Peso was shown at 29 shows and the only way the other exhibitors thought they could beat him was to get Mose away from Mildred and get him drunk. Bob and Mildred have many great memories of “Peso” and his year of showing at all the Midwest clubs. George Hatley told Mildred that “Peso” was the top 2-year-old in 1968 if records had been kept then. The 1969 gelding earned an astonishing number of awards from 1971-1975. Poncho displayed excellent conformation and color and was recognized with championship halter awards from junior through aged competition. 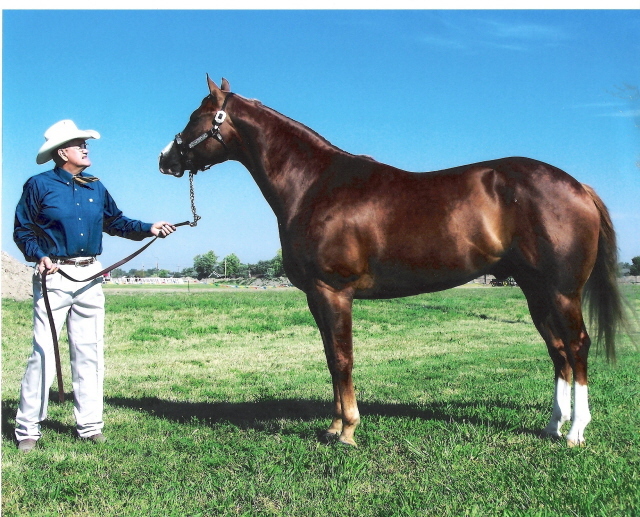 An all-around performance champion, Poncho received a multitude of state yearend awards, as well as regional and national championship awards in Western Pleasure, English Pleasure, Trail, Barrel Racing and Reining. A steady steed and companion for Luanne Thorndyke, Poncho McCardo carried her to many youth awards. Bernie is most noted for his training of championship trail horses including M.G.S Thunderbird, B.H.S. Rainbow Rose and Rambling Breeze. He has won multiple world championship titles and firmly believes that with a lot of hard work and training, anyone can compete in trail. Klassy Kettle (aka Hazel) won four ApHC World Championship titles, several Reserve National Championships, and many ApHC year-end high point titles. Hazel is owned by Barb Tool of Stapleton, NE. 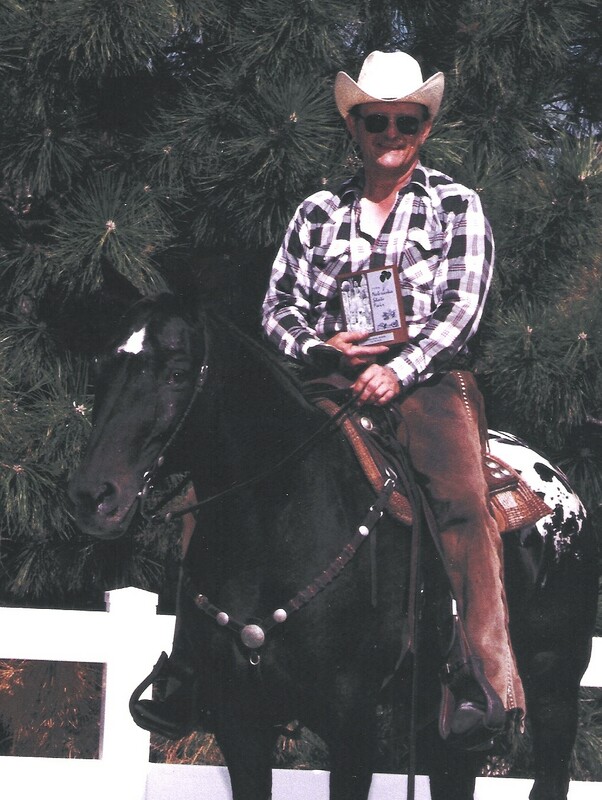 Paul Tierney was quoted as saying, “Hazel is such an athlete, I could take her anywhere in the United States and win money on her in roping.” Hazel is enjoying retirement in the pasture but occasionally will find time to visit the local nursing home or strut her stuff in local parades. The Nelms family of Hayes Center, Nebraska, are longtime Appaloosa breeders. Their horses included Red Clouds Fish Hawk, who was a state and regional all-around champion, as well as Nelms Polkadottot, who was the dam of Zippo’s Countryboy, Zippos Country Girl, Zip Code One, Captain Zip Ahoy and Just a Bit Fishy. These offspring have been successful in the show ring winning multiple National and World championships. Leonard and Iris played a major role in the founding of the Many Rivers Appaloosa Club which later merged to form the Nebraska Appaloosa Club. Tommy and Evelyn of Grand Island, Nebraska, were instrumental in founding the Nebraska Appaloosa club. They traveled hundreds of miles promoting the Appaloosa breed. Although Tommy & Evelyn didn’t have any children of their own, they were known for providing horses to children and taking them to shows. Some of their horses included Prince Pepe, Rudes Remark, Charlies Moon Rock, Handy Cash, Pepe’s Misty Moon, Pepe’s McCue, Pepe’s Copa Lakota and Mighty Nawata Bars. They raised numerous state and regional champions. Their horses’ offspring are still in the Appaloosa show ring today. Tommy and Evelyn also believed in giving back to their community. During the 1970s, they donated the money to build the Thompson 4-H arena at Fonner Park in Grand Island. Bob and Mildred Johannes are the proud owners of De-Lo-Way Farm started by a mare, De-Lo-Way Toots. Toots was the start for Bob and Mildred and their 3 sons, Dennis, Wayne, and Lowell. The family was active in the NAC Club as well as the MAHA Club. Bob was also an ApHC judge from 1980 to 1990. They were always willing to help and teach the kids at the show, and eventually were known as Grandma and Grandpa to all the youth kids at the shows. Mildred was never without her camera and “notepad” at all the horse shows and her pictures are in many of our scrapbooks through the years. The Johannes’s have always been supporters and promoters of our breed. The De-Lo-Way Farm name has been given to over 70 horses since 1958. Avid champions and breeders of Appaloosa horses for thirty years, the Thorndykes raised, trained and showed many state, regional, national, and world champion Appaloosas from 1970-2000. The Thorndykes were instrumental in the formation and management of the Mid-Con Appaloosa Region Association in 1975. Wayne served as Show Manager of Mid-Con for 6 years, and Mary Lou was publisher and ad-exec for the Mid-Con Annual Publication. War Bat came to JuLu Acres as a yearling stallion. The Thorndykes began showing him as a 2-year-old stallion in 1972. After a few shows, War Bat was soon gelded, and became Julie Thorndyke’s youth horse. 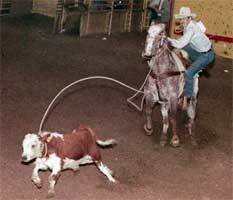 He was green broke by Jim Jirkovsky, who also rode him to win cattle points for NAHC and many reining awards. War Bat became the epitome of the versatility of the Appaloosa breed. His quiet disposition and willingness to do whatever asked made him an excellent youth and all-around horse for showmanship, western pleasure, reining and trail. He proved his ‘spots’ by helping Julie win the Youth Versatility Class at Opportunity ’74 in Columbus, OH. War Bat won 14 Champion and Reserve Champion All-Around Performance Horse Awards, 21 Grand and Reserve Halter Champions, and carried Julie to 22 High Point Youth Awards at induvial shows. War Bat was laid to rest in 1997 (age 27) on a farm in Nebraska, alongside his best friend Poncho McCardo (age 28), overlooking the Missouri River beneath the swaying trees. 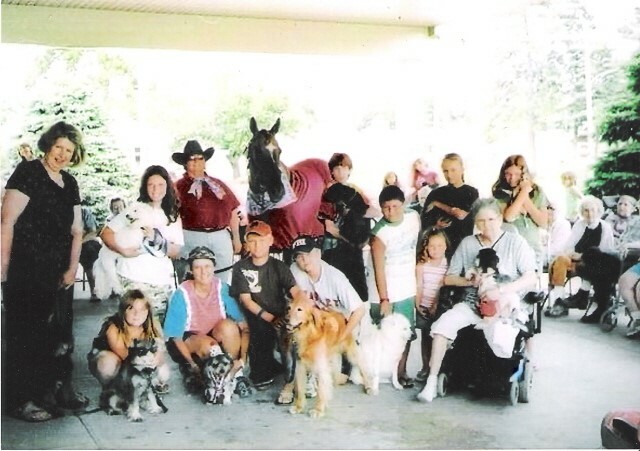 During the years that the Wolfe family has been associated with the Nebraska Appaloosa Club, they have had many memorable moments including 44 consecutive showings at the Nebraska State Fair. Horses have always been a part of Marvin’s life. His father and grandfather had some of the best-matched pair teams in the Murdock community. Marvin joined the Nebraska Appaloosa Horse Club and managed to take his daughter, Diane, to all of the shows in between farming and his hay and feed business. It didn’t take long before he became really involved with the Nebraska Appaloosa Horse Club serving on numerous committees and holding many elected positions. Over the years, Marvin became well known for his “tent,” the social gathering place for everyone at the horse shows. He capitalized on “Marv’s Tent” and auctioned off seats under the tent at all of the fundraisers for the Nebraska Appaloosa Horse Club. 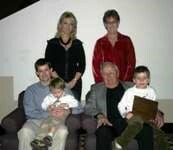 The Erickson’s are best known for being the parents of the famous “Erickson boys” of Sutton, NE. If you pulled into a horse show and saw the Erickson boys horse trailer, you knew the competition was going to be tough. Kip, Rourk, Dusty and Jorn were all avid Appaloosa exhibitors and won in all events from showmanship to games and roping. They were Nebraska State 4-H Champions, Nebraska Appaloosa Club Champions, Mid-Con Champions and National Champions in several events. Some of their horses included Max Patch, Skips Folly, Ms. Skip Bright, Adda Apache, Bright Hand, Barney Bright and Spurs Boomerang. Rita and Loyle are the donors of the Rourk Erickson Memorial Award in honor of their son, Rourk, who passed away in a tragic accident. Rita and Loyle made many sacrifices for their children to be active in the show ring. Showing kept the family busy and kept the family together. Rita and Loyle are to be commended for their dedication. 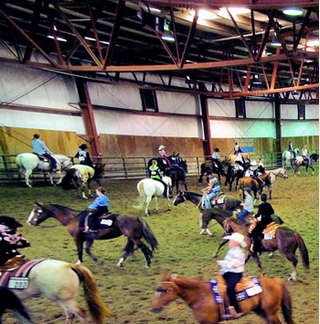 Dave of Grand Island, Nebraska, is best known in the Nebraska Appaloosa Club for having a great time. You could always count on Dave to come up with some kind of entertainment for the show. He competed in Western, English, Heritage and Roping events. Over the years, he won state, regional and national titles. He competed on several horses over the years but the one everyone remembers was Red Chief or better known as RCA. Dave is the owner of the Grand Island Western Shop and has always been a huge supporter of the Nebraska Appaloosa Club. He has always been willing to donate, advertise or sponsor.